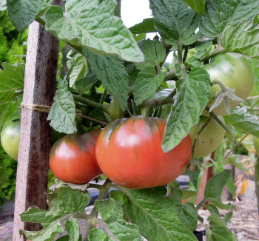 70 days from transplant – first offered to the public in 2010 by Tomato Growers Supply Company. Dwarf Wild Fred is a regular leaf dwarf variety that produces oblate medium to medium large fruit that ripen to a dusky rose purple hue. The flavor is well balanced and sweet, and the variety is quite prolific. It originated from a cross made by Bruce Bradshaw between New Big Dwarf and Carbon and named Sleazy. Dwarf Wild Fred was selected and named by Craig LeHoullier. The name was chosen to honor Craig’s dad, Wilfred, who passed away just a few years before the variety was released. Wilfred inspired Craig to garden when he was a very young boy, and his favorite tomato was Cherokee Purple. One Sunday, the church in which Wilfred was sexton misspelled his name in the program as “Wild Fred LeHoullier”, which gave him endless laughs. Again, sometimes tomato names just appear perfectly appropriate, and none more than this!